In this era of "faith-based initiatives," congregations increasingly find themselves in the business of establishing and supporting community ministries-daycare for infants and toddlers, respite care for elders, and programs for housing rehab and home repair, tutoring, and social justice advocacy. 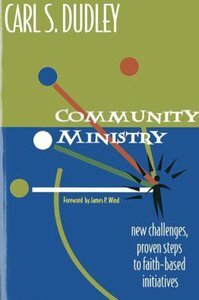 In this volume, Carl S. Dudley revises and updates his earlier book, Basic Steps toward Community Ministry, which Loren Mead called "the most valuable book on parish ministry I've seen in a decade." Carl S. Dudley is codirector of the Center for Social and Religious Research and professor of church and community at Hartford Seminary. He is author of numerous books, including "Studying Congregations", and has been a pastor in metropolitan and cross-cultural congregations.